Model 2200-2230 Hopper Feeders are designed to feed longer cut to length bars, tubes and machined parts 12″ to 20″ long (Model 2220) or up to 30″ long (Model 2230) with diameter ranges within a 2 to 1 ratio. Parts are hand stacked, bundle loaded or with modifications to the hopper loaded from a conveyor from a previous operation. This type of feeder is very suitable for non-mar applications when parts are finished or in a pre-heat treated state. 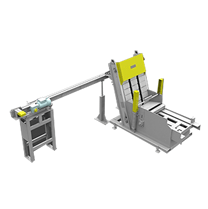 The parts are elevated on singular elevator pads then discharged rolling into a magazine, then escaped rolling either to a cross conveyor, a pusher device, a walking beam, or customer tracking. Noise levels are very low due to zero recirculation of parts. These feeders have fed parts such as steering racks, strut piston rods, copy machine rolls, axle shafts and many other shaft type parts. 12″ to 20″ tubes are hand stacked, bundle loaded or with modifications to the hopper loaded from a conveyor from a previous operation. This type of feeder is very suitable for non-mar applications when parts are finished or in a pre-heat treated state. Noise levels are very low due to zero recirculation of parts. Feeds from a manually stacked hopper. The power steering shafts are stacked diameter to diameter in the hopper. There is a movable side plate within the hopper with quick release handles that will adjust for the variable lengths of the shafts. The shafts are elevated out of the hopper one at a time and will be carried over the top of the elevator and discharged rolling onto a rear mounted discharge chute equipped with a high level control proximity switch. One shaft at a time is escaped rolling to the Tocco pusher device, per signal from Tocco machine. Feeds from an automatic or hand loaded, floor-mounted hopper. Steel bars are elevated out of the hopper and discharged rolling, diameter-to-diameter into a load magazine on a universal automatic double end finisher. Feeds steering racks from a random loaded, floor mounted hopper. The steering racks are elevated from the hopper via a cleated belt and deposited into an accumulating chute. An air operated escapement device loads one part at a time onto customer supplied rear mounted horizontal conveyor. Feeds steering racks from an automatic or random loaded, floor mounted hopper. The steering racks are then elevated from the hopper and discharged rolling into an accumulation chute, where they are escaped one at a time onto a rear mounted, cross-feed conveyor. The conveyor transfers the parts in a continuous stream to the workrest of a Cincinnati Model 340-20 DE centerless grinder. Then a Model 1650 conveyor transfers the parts between two Cincinnati Model 340-20 DE centerless grinders. Then the next Model 1650 conveyor transfers the parts from a Cincinnati Model 340-20 DE centerless grinder onto a collection ramp. Feeds steering racks from a manually loaded, floor mounted hopper. The racks are elevated from the hopper via a cleated belt and carried over the top of the elevator and deposited onto a rear mounted, accumulation ramp in a continuous, diameter-to-diameter stream. An air operated escapement device loads one part at a time into rear mounted, V-Nest for customer pick off via lift and carry transfer. Feeds steel bars from a random loaded, floor mounted hopper. Bars are loaded via drop bottom gondolas into hopper via an air operated tilting stand. Once loaded, the bars are then elevated from the hopper via a cleated belt and deposited onto a rear mounted accumulation ramp. An air operated escapement device loads one part at a time into customer supplied pusher device feeding an induction heater. Feeds agitator shaft blanks from a manually loaded, floor mounted hopper. Blanks are loaded via drop bottom gondolas into hopper via an air-operated tilting stand. The blanks are elevated from the hopper via a cleated belt, carried over the top of the elevator and escaped onto a rear mounted, cross-feed conveyor in a continuous, end-to-end stream. An air-operated transfer device loads one part at a time into the load chute of a multi-spindle chucker. Feeds agitator shafts from a random loaded, floor mounted hopper. The shafts are elevated from the hopper via a cleated belt and deposited onto a rear mounted accumulation ramp. An air operated escapement device loads one part at a time onto a cross-feed conveyor, which translates the parts in a continuous, end-to-end stream to the workrest of a centerless grinder.